July 25 is the feast of Saint Christopher and below is a 1910 paper by the Belfast antiquarian, F. J. Bigger, in which he examines a later medieval carving of the saint from Jerpoint Abbey, County Kilkenny. The author, a northern Presbyterian, threw himself wholeheartedly into the Irish cultural revival in all its aspects. To his eye, the Jerpoint Saint Christopher possessed a uniquely 'Gaelic fervour' missing in the artistic representations of other lands. I regret that the accompanying illustration of the kilted Saint Christopher is not of better quality, but it is one of Bigger's own photographs reproduced in the Journal of the Royal Society of Irish Antiquaries. If you have a look at some of the photographs on this site, you will be able to enjoy a picture of Bigger himself resplendent in a kilt, bonnet and Tara-style brooch, what the well-dressed cultural revivalist was wearing a century ago. Bigger's collection of Irish books became the core of the Irish and Local Studies Department of the Belfast Central Library, and thus his legacy lives on in the city. ST. CHRISTOPHER IN IRISH ART. BY FRANCIS JOSEPH BIGGER, M.R.I.A., FELLOW. AT Jerpoint Abbey, in County Kilkenny, there is much sculpture amongst the tombs and in the building itself. Built up against one of the pillars of the cloister, in high relief, were two figures that deeply attracted my attention, because I had not previously noticed similar figures in any other part of Ireland. Many of the cloisters of our abbeys have been destroyed, and with them much legendary lore which the monks chose to carve there on wall and column. Every stone of a cloister is worth examining. Here are found the best mason-marks, quaint little pieces of Celtic ornament and symbolism. I have noticed such at Quin, and at Drumahaire there is a St. Francis preaching to the birds. At Bective there are quaint figures in the cloisters, also at Fore. I have only noticed one St. Christopher, and that is at Jerpoint. This abbey was founded in 1158, but the cloisters date from the end of the fourteenth century, so the statue is about the later date. The story of St. Christopher is generally told in mural paintings. Many hundreds still remain in England and on the Continent, and there are numerous old prints with similar portraits. Shortly, the legend is as follows: Christopher (literally, Christ-bearer) received his name because he bore Christ across a stream in Syria. When he gave up paganism, he desired to do some great Christian service, being a giant in stature and strength. He undertook to ford strangers across a deep stream. Once in the night a little Child presented himself to be carried across. Christopher carried the Child on his shoulder until the burden grew so heavy he almost sank in the waves. He succeeded at last in getting across, when he said, "Child, thou hast put me in great peril; if I had had the whole world upon me, it might be no greater burden." And the Child answered, "Christopher, marvel nothing; for thou hast not only borne all the world upon thy shoulders, but thou hast borne Him that made and created the world. I am the Christ whom thou servest." And so the saint is mostly represented crossing a stream, with a treelike stake in his hand for support, and the Infant on his shoulders. There are those who say the whole story is allegory; that Christopher is Christ the Cross-bearer, the Child is the offspring of Adam, the river is Death. The saint is a giant or mighty person, because the Redeemer was able to bear the burden of the sins of the world. Be all this as it may, here we have St. Christopher carved in stone after the manner of the Irish, and set up in the cloister of an Irish abbey as a lesson and an example. The figures are boldly carved, the whole stone being about 3 feet high. The saint is kilted and draped in the Gaelic way, showing bare legs and feet, with a wave across the feet and a large fish cut upright beside the left leg, reaching from the foot to above the knee. In his right hand he grasps a stout stake or tree, with a crowned or branched top, while his left arm lovingly embraces the Child, thus showing a Gaelic fervour lacking in all the representations I have seen of other countries, where the Child sits on the shoulders unclasped. A halo surrounds the head of the Divine Infant, whose face is upturned, and His right hand is upheld in the attitude of blessing. The saint has on his head a cap or crown, and his beard is interlaced and twined in the Irish style. The whole representation savours of local art, with the deep Gaelic spirit so commonly traceable during the Irish revival of the late fourteenth and fifteenth centuries. In conclusion, I may add that the late Walter B. Mant, Archdeacon of Down, wrote at Hillsborough a poem on this subject, and published same in 1861 in a volume entitled Christopheros and other Poems. Yesterday I posted on a modern scholar's analysis of the tradition that Saint Declan of Ardmore, whose feast we celebrate today, was one of four 'pre-Patrician saints', credited with the introduction of Christianity to Munster before the coming of Saint Patrick. In reading the Life of Saint Declan, it is interesting to observe how the hagiographer is keen to establish his subject's pre-Patrician credentials whilst at the same time showing the proper respect to Saint Patrick as the chief bishop of the Irish. The headings below are mine, the text from the translation by Patrick Power at CELT . Declan judged it proper that he should visit Rome to study discipline and ecclesiastical system, to secure for himself esteem and approbation thence, and obtain authority to preach to the Irish people and to bring back with him the rules of Rome as these obtained in Rome itself. He set out with his followers and he tarried not till he arrived in Rome where they remained some time. When Declan had spent a considerable time in Rome he was ordained a bishop by the Pope, who gave him church-books and rules and orders and sent him to Ireland that he might preach there. Having bidden farewell to the Pope and received the latter's blessing Declan commenced his journey to Ireland. Many Romans followed him to Ireland to perform their pilgrimage and to spend their lives there under the yoke and rule of Bishop Declan, and amongst those who accompanied him was Runan, son of the king of Rome; he was dear to Declan. On the road through Italy Bishop Declan and Patrick met. Patrick was not a bishop at that time, though he was (made a bishop) subsequently by Pope Celestinus, who sent him to preach to the Irish. 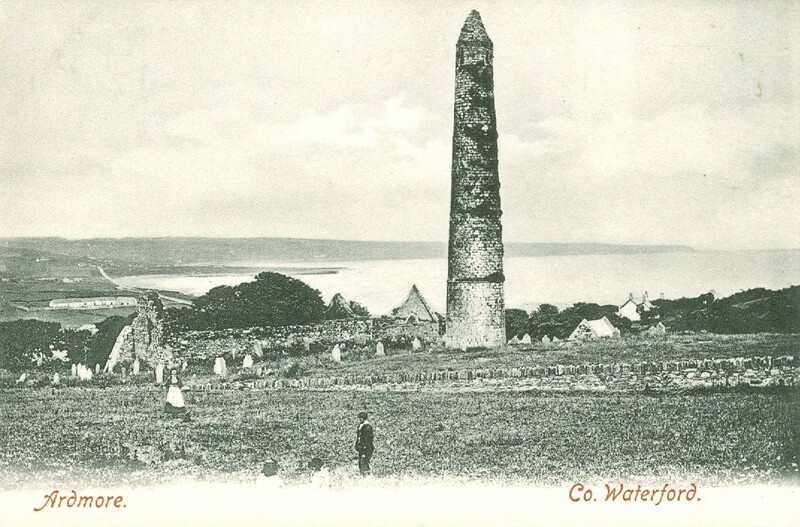 Patrick was truly chief bishop of the Irish island. They bade farewell to one another and they made a league and bond of mutual fraternity and kissed in token of peace. They departed thereupon each on his own journey, scil. :—Declan to Ireland and Patrick to Rome. After this Declan came to Ireland. Declan was wise like a serpent and gentle like a dove and industrious like the bee, for as the bee gathers honey and avoids the poisonous herbs so did Declan, for he gathered the sweet sap of grace and Holy Scripture till he was filled therewith. There were in Ireland before Patrick came thither four holy bishops with their followers who evangelized and sowed the word of God there; these are the four:—Ailbe, Bishop Ibar, Declan, and Ciaran. They drew multitudes from error to the faith of Christ, although it was Patrick who sowed the faith throughout Ireland and it is he who turned chiefs and kings of Ireland to the way of baptism, faith and sacrifice and everlasting judgment. The angel of God came to Declan and said to him ‘Go quickly to Patrick and prevent him cursing your kindred and country, for to-night, in the plain which is called Inneoin, he is fasting against the king, and if he curses your people they shall be accursed for ever.’ Thereupon Declan set out in haste by direction of the angel to Inneoin, i.e. the place which is in the centre of the plain of Femhin in the northern part of the Decies. He crossed Slieve Gua and over the Suir and arrived on the following morning at the place where Patrick was. When Patrick and his disciples heard that Declan was there they welcomed him warmly for they had been told he would not come. Moreover Patrick and his people received him with great honour. But Declan made obeisance to Patrick and besought him earnestly that he should not execrate his people and that he should not curse them nor the land in which they dwelt, and he promised to allow Patrick do as he pleased. And Patrick replied:—‘On account of your prayer not only shall I not curse them but I shall give them a blessing.’ Declan went thereupon to the place where was the king of Decies who was a neighbour of his. But he contemned Patrick and he would not believe him even at the request of Declan. Moreover Declan promised rewards to him if he would go to Patrick to receive baptism at his hands and assent to the faith. But he would not assent on any account. When Declan saw this, scil. :—that the king of the Decies, who was named Ledban, was obstinate in his infidelity and in his devilry—through fear lest Patrick should curse his race and country—he (Declan) turned to the assembly and addressed them:—‘Separate yourselves from this accursed man lest you become yourselves accursed on his account, for I have myself baptised and blessed you, but come you,’ said he, ‘with us, to Patrick, whom God has sent to bless you, for he has been chosen Archbishop and chief Patron of all Erin; moreover, I have a right to my own patrimony and to be king over you as that man (Ledban) has been.’ At this speech they all arose and followed Declan who brought them into the presence of Patrick and said to the latter:—‘See how the whole people of the Deisi have come with me as their Lord to thee and they have left the accursed prince whose subjects they have been, and behold they are ready to reverence you and to obey you for it is from me they have received baptism.’ At this Patrick rose up with his followers and he blessed the people of the Deisi and not them alone, but their woods and water and land. Whereupon the chiefs and nobles of the Deisi said:—‘Who will be King or Lord over us now?’ And Declan replied:—‘I am your lord and whomsoever I shall appoint offer you as lord, Patrick and all of us will bless, and he shall be king over you all.’ And he whom Declan appointed was Feargal MacCormac a certain young man of the nation of the Deisi who was a kinsman of Declan himself. He (Declan) set him in the midst of the assembly in the king's place and he was pleasing to all. Whereupon Patrick and Declan blessed him and each of them apart proclaimed him chieftain. Patrick moreover promised the young man that he should be brave and strong in battle, that the land should be fruitful during his reign. Thus have the kings of the Deisi always been. Declan, Patrick of the Deisi—the Decies to Declan for ever. This is equivalent to saying that Ailbe was a second Patrick and that Declan was a second Patrick of the Decies. After that, when the king had bidden them farewell and they had all taken leave of one another, the saints returned to their respective territories to sow therein the seed of faith. As is well known, four saints, the quatuor sanctissimi episcopi as they are called since Ussher first drew attention to them in the 17th century, Saint Ailbe of Emly, Saint Declan of Ardmore, Saint Ciaran of Cape Clear and Saighir and Saint Ibar of Beggery Island, are supposed to have brought Christianity to Munster. As no Life of Ibar exists, his dossier has to be reconstructed from that of his supposed nephew, Abban of Kilabban and Moyarney. 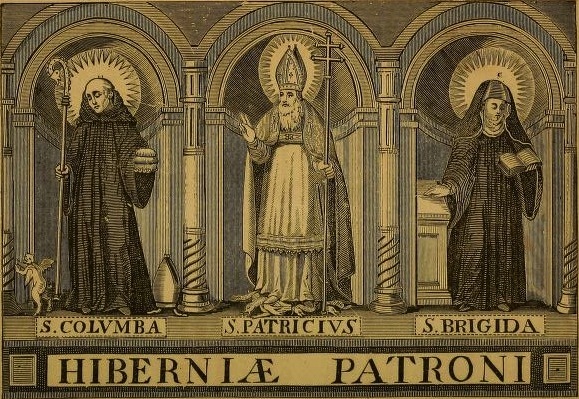 The other three saints, however, have very full records which, leaving aside the usual miracle stories, agree in maintaining that their subjects converted many people before Patrick ever came to Ireland. O Riain-Raedel believes that fellow researcher Richard Sharpe has identified the central episode in this tradition - the conversion at Cashel of King Oengus Mac Nadfroich by Saint Patrick. I can never hear this story without recalling fond memories of an archaeological field trip in which a visit to the Rock of Cashel formed the climax. The site made a deep impression on me, as did the wonderful story that Saint Patrick, in converting the pagan king, inadvertently put his staff through the royal candidate's foot. The king stood there stoically with blood pouring from his wound, thinking it was all part of the reception ceremony and doubtless also thinking that this Christianity was a religion for real men! received further elaboration in the Lives of the Saints in question. The Life of Ailbe, for instance, attaches to the episode the claim that Patrick specifically gave Munster to Ailbe, while the Life of Declan similarly names Ailbe as secundus Patricius et patronus Mumenie. Both of these texts also assert that Ailbe was to be the archbishop of Munster, with his seat at Cashel. 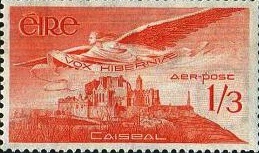 As Sharpe has pointed out, Cashel was the focal point of most episodes involving pre-Patrician saints. However, Cashel became connected closely with Church affairs only after it was chosen as the site of an archiepiscopal see in 1111. Having no founder saint as such, it understandably came within the neighbouring monastery of Emly, Ailbe. must be set in a context involving the need for Munster churches to assert themselves against the predominance of Armagh. 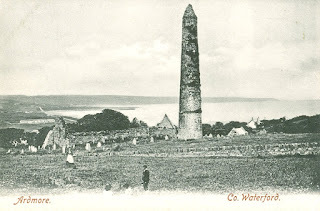 The archiepiscopal see of Munster would seem to have been intent on consolidating its position as the second most important ecclesiastical institution on the island. The introduction in 1152, at the Synod of Kells, of the two additional archiepiscopal sees of Dublin and Tuam may have given rise to the need for such consolidation. We have little information on the background to the formation of the various diocesan territories during the 12th century. However, it may not be a coincidence that nearly all of the churches connected with the so-called pre-Patrician saints were threatened by the interests of other churches at this time. Emly, for instance, had to contend with the encroachment of the O'Brien-sponsored diocese of Killaloe, just as Roscarberry had to fend off a threat from Cork. Similarly, Ardmore's claim to supremacy over the Deisi flourished for only a short time during the latter half of the 12th-century before losing out to the churches of Lismore/Waterford. The establishment and revisions of the Irish diocesan structures by the reforming synods of the 12th century in effect created the conditions that gave rise to the need for pre-Patrician saints... The saints were certainly a godsend when it came to arguing the case for one or other diocesan interest. It would thus seem to be the case that the claim for pre-Patrician saints in Munster was first propagated in writing on the Continent in the Schottenklöster of Germany, in answer to conditions in Ireland. very fortunately for Cashel, the industrious scriptorium at Regensburg in Germany was prepared to expend much ink on promoting and defending the interests of Munster. About 1150 a monk there [Regensburg] composed the Life of Saint Albert, Archbishop of Cashel, who with his friend Archbishop Erhafd of Armagh, undertook a pilgrimage and ended up in Regensburg, where both found their last resting place. In the Germanic form of his name 'Albert', Ailbe is here firmly connected with the metropolitan see of Cashel. Whatever accommodation had to be made, whether Palladius had to cede ground to Patrick or Patrick had to contend with the priority claimed for some Munster saints, the argument almost always turned on the position of the patron of Armagh. And that he still has to contend with the notion of a pre-Patrician evangelization of Munster stems from the inherent plausibility of the claim that it was here that Christianity first took hold in Ireland. Dagmar O Riain-Raedel, 'The Question of the "Pre-Patrician" Saints of Munster' in M.A. Monk and J. Sheehan (eds. ), Early Medieval Munster - Archaeology, History and Society (Cork University Press, 1998), 17-23. The Author of the Martyrology, and the Place in which it was composed. The author of the Martyrology now published was Mael-Maire hua Gormain, otherwise called Marianus Gorman, abbot of Cnoc na n-Apstol ' the Hill of the Apostles,' a monastery of Canons Regular of St. Augustine at Knock close to the town of Louth. All that is really known of him is derived from the preface to his Martyrology, which uses the first person (rodherbsamar fuaramar, tuccsamar) when referring to the author,and may well have been written by Gorman himself, though Colgan ascribes it to an ancient scholiast. Hence it appears that Gorman was abbot of Cnoc na n-Apstol (otherwise called Cnoc na Sengán, ' the Hill of the Pismires '), and that he composed his Martyrology while Ruaidre hua Conchobair was King of Ireland, while Gelasius or Gilla mac Liac was archbishop of Armagh, and while Aed hua Cáillaidhi was bishop of Oriel, i.e., the present counties of Louth, Armagh, and Monaghan. Ruaidre began to reign as monarch of Ireland about the year 1166 and retired in 1183 to the monastery of Cong, where he died in 1199. Gilla mac Liac was archbishop of Armagh from 1137 to 1173, when he died. Aed hua Cáillaidhi was bishop of Oriel from 1139 to 1182. The result is, if the statements in the preface are true, that Gorman must have composed his Martyrology at some time between 1166 and 1174, 'circa annum 1167,' says Colgan.
' Hic videtur esse B. Marianus Gormanus, author Martyrologii, a nobis laudatus, quem constat anno 1172 fuisse eiusdem monasterii Abbatem, ut praefatio eius Martyrologio prefixa, tradit' If Colgan's conjecture be right—and Lanigan agrees with him—the insertions may have been made by Gorman himself But I know of no sure instance of an Irishman being called at one time after his paternal, at another after his maternal, grandfather. Gorman is commemorated in the Martyrology of Donegal at July 3. He was probably canonised, not by the Apostolic See, but by his metropolitan, the archbishop of Armagh, just as in 1153, St. Gaultier, Abbot of Pontoise, was canonised by the archbishop of Rouen. Kalend. Januar. V. feria bin. X. Anno Domini MCLXX. A prayer for Donnchadh O'Carrol, supreme King of Airgiall, by whom were made the book of Cnoc na nApstal at Louth and the chief books of the order of the year, and the chief books of the Mass. It was this great king who founded the entire monastery both [as to] stone and wood, and gave territory and land to it, for the prosperity of his soul in honour of [SS.] Paul and Peter. By him the church throughout the land of Oirghiall was reformed, and a regular bishopric was made, and the church was placed under the jurisdiction of the bishop. In his time tithes were received, and the marriage [ceremony] was assented to, and churches were founded, and temples and cloictheachs were made, and monasteries of monks and canons and nuns were re-edified, and nemheds were made. These are especially the works which he performed for the prosperity [of his soul] and reign, in the land of Airghiall, namely, the monastery of monks on the bank of the Boyne [both as to] stone and wooden furniture and book, and territory and land, in which [monastery] there are one hundred monks and three hundred conventuals, and the monastery of canons of Termann Feichin and the monastery of nuns, and the great church of Termann Feichin, and the church of Lepadh Feichin and the church of * * *. Whitley Stokes, ed. and trans., Félire Húi Gormáin, The Martyrology of Gorman, (London, 1895), xix-xxi. St. Lugid or Lughaidh, Son of Lugeus or Lughaidh. ... The Martyrology of Tallagh enters the name of Lugidius, son of Lugeus, as having veneration paid him, at the 1st of July. Thus was he distinguished, at an early period of our ecclesiastical history, among his contemporaries. Marianus O'Gorman has a similar notice in his Martyrology, at this day. Cathal Maguire agrees in the paternity, and he adds, that the present holy man was Bishop of Cluain-camaint. It is now difficult to identify this ancient place. The Bollandists, who notice Lugidius filius Lugei at the 1st of July, state, that Cluain-camaint was unknown to them, but they suggest, that a Cluaid-camhain is mentioned in the Annals of Donegal, at the year 1089. Where they obtained such information is not apparent to us. Lughaidh, son of Lughaidh, is the entry of the O'Clerys, in the Martyrology of Donegal at this date.